High-resolution aerial maps show details needed for solar design and installation. The adage holds that a picture is worth a thousand words. But in the solar industry, a picture is worth about $500 — and maybe a lot more. At least that is one conclusion that can be drawn from a recent survey of more than 200 U.S. solar installers conducted by Aurora Solar, a San Francisco-based startup that provides software to streamline the sale, design and construction of solar projects. “We found that, on average, solar installers spend over $500 in change orders,” said Samuel Adeyemo, a co-founder of Aurora. “That’s what happens when you sell something you can’t install or there are errors in the estimates of how many modules can fit on a property.” In many cases, obtaining more accurate imaging upfront could limit or eliminate the need for changes. The errors can lead to negative outcomes, including excessive site visits to a customer’s property and potentially poor word of mouth from unhappy customers. Compounded across the solar industry, these are also the type of inefficiencies that have kept soft costs stubbornly high, even as panels, inverters and other types of equipment have consistently gotten cheaper. U.S. soft costs are falling overall, according to GTM Research, but at a slower rate than other solar PV elements. Non-installation soft costs still make up more than half the price of a residential solar PV system, and GTM Research forecasts that customer-acquisition costs will continue to rise in the short term. Installers are increasingly avoiding some of the inefficiencies and mistakes that lead to change orders by leveraging aerial imagery. Solar installers big and small have moved away from sending crews out to climb on roofs to take measurements on the homes and businesses of prospective customers. 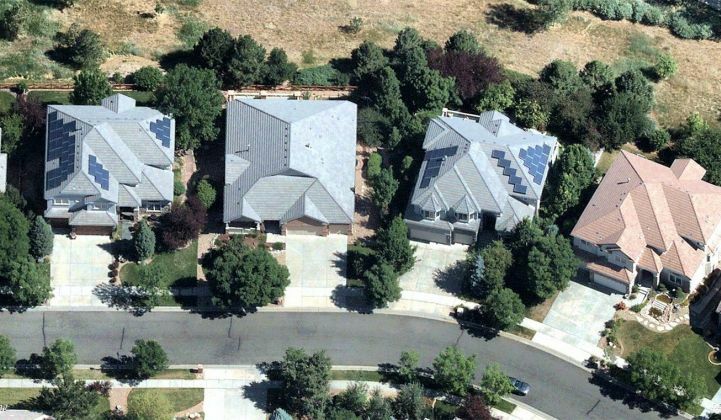 In recent times, solar installers have used satellite imagery to gauge how many panels could fit on a roof and estimate how much production could be expected. But like so much else in solar, the sophistication around what’s possible with aerial maps has accelerated as the industry has matured. At the most basic level, the aerial maps solar installers can use today to produce sales presentations and plan for efficient installations are far more accurate and detailed — and will only become more so in the near future. For example, Nearmap outfits airplanes with its patented high-resolution camera system. “Not only do you see the truth on the ground, but you see it in sub-3-inch imagery,” said Agresta. “That means one pixel on the camera equals 2.8 inches on the Earth’s surface.” By comparison, satellite resolution is typically between one pixel per foot to one pixel per meter. Nearmap’s imagery includes vertical maps, which provide a vertical view of sites, as well as multi-perspective angled views and wide-area panoramas. Most of the cities are captured at least two times per year, providing both “leaf-on” and “leaf-off” imagery. The images are provided through an imagery-as-a-service business model, in which small installers can access a smaller volume of photos at a lower price, while larger installers can get thousands of images. The company originated in Australia and now has over 87,000 users across more than 8,500 companies in Australia, New Zealand and the U.S. Momentum utilizes Nearmap’s imaging through Aurora’s platform, which basically turbo-charges what is possible with Nearmap’s API using algorithms that improve the accuracy and efficiency of solar system design. For example, while it’s undoubtedly a big help to the designers of a solar array to have an accurate image to help pinpoint potential shading issues and roof obstructions, it’s even more efficient if a sophisticated algorithm can do it automatically. Today, Nearmap customers using MapBrowser can easily migrate to the Aurora platform at no additional cost or continue to access the imagery directly from Nearmap’s MapBrowser. The ability of imagery to transport designers directly to potential project sites will only become more sophisticated over time. Even today, the imagery is granular enough to provide a view of the pitch of a roof and the height of a building. In the future, machine learning and artificial intelligence will allow Nearmap to detect features that are useful in prospecting, installation and service, an evolution of the technology to reality-as-a-service. “Rather than hunt and peck through properties, with applied machine learning you can say, ‘Show me the properties within 10 square miles of this point that have solar,' or 'Show me the ones that don’t,’” said Agresta. Through more accurate detection of property features, Nearmap’s machine-learning algorithms will be able to differentiate skylights from panels, pools from ponds and other ground features, allowing for highly specialized instant search. The result will allow installers to close more deals with fewer change orders and better designs.